Momentum is a property of an object with mass. 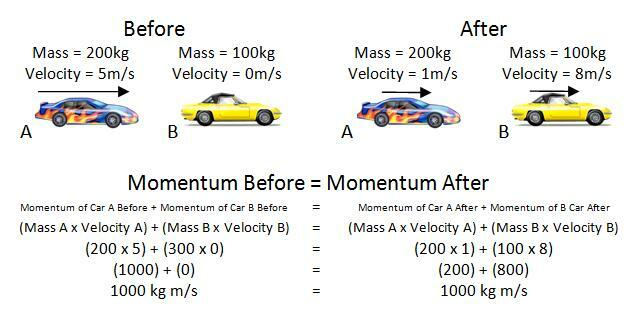 It is a measure of its instantaneous kinetic energy and is a measure of how easy it is to change its velocity, i.e. to change its direction or speed it up/slow it down. The higher the momentum, the harder it is to stop. If two objects collide, the total momentum before the collision will be the same as the total momentum after a collision. Momentum is conserved. You might be asked to calculate velocities after a collision. Remember that velocity is a vector! If two objects are travelling in opposite directions, one will have a negative momentum. We can rearrange Newton's second law to look at momentum and we find out that if you take a longer time to change momentum, ie. you slow down more gently, you need less of a force. This is important in accidents.